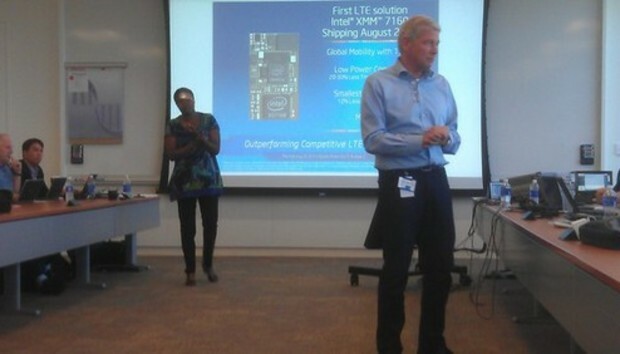 Intel will ship multimode LTE capabilities by the end of the month, Intel executives said Monday. It's a technology the company is throwing its weight behind--and needs, if it's to compete in the U.S. market. Why? Because LTE is a pitch right in Intel's wheelhouse--high-speed mobile data makes the company's CPUs and GPUs even more valuable, while the relatively high power consumption those chips require can be mitigated with Intel's process technology. And LTE has been the gating factor in placing Intel's mobile chips into U.S. handsets. Intel began shipping a single-mode LTE solution in the fourth quarter of 2012, and it plans to ship a multimode chip, the XMM 7160, by the end of the month, Aicha Evans, the vice president of Intel's Mobile and Communications Group, said in a press conference on Monday. At Intel, combining communications with mobile computing is inseparable: "Everything that computes must connect," Evans said. Specifically, the XMM 7160 will support 15 LTE bands, with 20 to 30 percent lower power consumption than competitive solutions. The XMM 7160 will also be about 12 percent physically smaller than competing chips, Evans said. Both Qualcomm and Intel are shipping or nearly shipping multimode LTE; MediaTek, Broadcom, Marvell, and Nvidia have announced multimode LTE plans. The problem that Intel faces--and that the chipmaker is hurriedly working to overcome--is the reputation as a "fast follower" in the wireless space. Intel bought Infineon's wireless business in 2010, for $1.4 billion. But at the time of that purchase, Infineon's technology was only at the 2G/3G stage. Since then, the company has worked to catch up, running design teams in parallel "to step up to a leadership position," said Hermann Eul, the general manager of the Intel Mobile and Communications Group. Intel isn't there yet. In June, for example, rival Qualcomm announced the integration of multimode 3G/4G LTE into its Qualcomm 400 processors. That's a step beyond Intel; Intel's XMM 7160 is a discrete chip, and the company has not announced plans to integrate the XMM 7160 functionality into its application processors, Eul said. "We will do it when the time is right," he added. Intel's announcement, as well as its upcoming integration plans, represent a key strategic element for Intel's continued push into the wireless business. Intel has expended a great deal of effort to push its mobile processors--the "Clover Trail+" Atom chip, and the upcoming "Bay Trail"--into mobile handsets. But its only design win of note is the Lenovo K900 handset, restricted to the Chinese market. Why aren't Intel's mobile chips in handsets selling within the U.S.? "Absence of LTE is the reason," Tom Kilroy, Intel's vice president of sales, said, according to Engadget. "We can't get ranged by U.S. carriers without LTE, so once we have multimode LTE coming to market later this year, we have an opportunity to compete in that business." According to Will Strauss, a digital signal processor analyst with Forward Concepts, Intel's XMM 7160 chip has been qualified with AT&T and Verizon. Evans declined to comment, but acknowledged that the lack of LTE has held the company back. Finally, there's the computing element. Intel executives said that download speeds would be up to 100 Mbit/s, a theoretical limit that's dependent on the carrier and available spectrum. But without that additional data, it's difficult to justify a premium Intel CPU versus a cheaper model. Now, Intel simply has to convince handset makers that it's a player. In 2014 and 2015, Intel is striving for "credibility," Evans said, while its technical roadmap includes such capabilities as voice over LTE and LTE Advanced technology. A 7260 chip may include those capabilities.